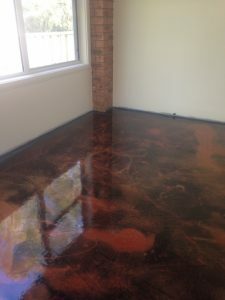 Here is your opportunity to choose from a range of decorative epoxies that are safe, reliable and look amazing. This is a vibrant, affordable and highly attractive decorative flooring system that allows you to customize your own design approach. Choose from our extensive range of decorative coatings for a shining, strong and vibrant flooring solution. Designed for Decorative Use– No longer do we have the frustration of using generic industrial resins that bubble and crawl etc. The FloorChef range was extensively developed over a two year period specifically for decorative purposes. Eco-certified– This product has been independently assessed and eco-certified as a “Good Environmental Choice” under international standard ISO 14020. Solventless and Odourless– We can assure a totally safe application indoors without disruption to your business or harm caused to nearby people. Totally Unique– So adaptable that designs will only be limited by your own imagination! FloorChef allows you to freely suit your own style, taste or colour scheme. Affordable– Extremely cost-competitive compared to other flooring alternatives which results in a lower priced end product.